14:00 at The Hague Central Station (inside under the light cloud). Please register (see email on this topic). 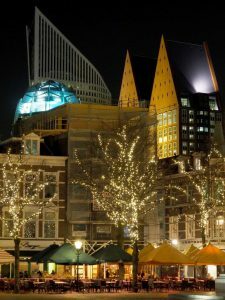 For the month of November we have put together a city walk around the Hague city center and it’s architectural sights. This will give us a great opportunity to shoot some material for the next Club Night or just to practice. Already the Central Station itself offers interesting photo opportunities. From there we will visit New Babylon and the Ministry of Foreign Affairs, the move towards the governmental quarter and throgh the Turfmarkt towards the City Hall and the library. From there the plan is to continue down the Grote Marktstraat and pass through the new and the old passages on the way to Buitenhof, the Hofvijver and the Binnenhof. The Ministry of the Finance with it’s colourful gates is just a short walk away from there. We can close off our walk with the walk along the Lange Voorhout towards the city center where we can have a closing drink. If the weather permits it will be a nice idea to shoot the Hofvijver at sunset (so, just before stopping for a drink). To keep you all busy we thought of handing out theme cards for each participant of the walk. The subject is known only to that one participant. This way you can train to search for certain things around you and we can have a short slide show of 2 photographs per participant to see who had which subject. For this walk you can consider taking filters and a tripod with you, as well as lenses with different focal lengths.